Why Political Ads In 2012 May All Look Alike There's supposed to be a difference between a candidate's ads that are financed by relatively small and disclosed money, and the big-budget, secretly funded ads from outside groups. But this year, those supposed differences don't mean much. Among the biggest advertisers in the presidential campaign is a group that says it doesn't do political advertising: Crossroads GPS. Crossroads GPS — which stands for Grassroots Policy Strategies — was co-founded by Republican strategist Karl Rove. It and others like it enable wealthy donors to finance attack ads while avoiding the public identification they would face if they gave to more overtly political committees. There's supposed to be a difference between a candidate's ads that are financed by relatively small and disclosed money, and the big-budget, secretly funded ads from outside groups. But this year, those supposed differences don't mean much. 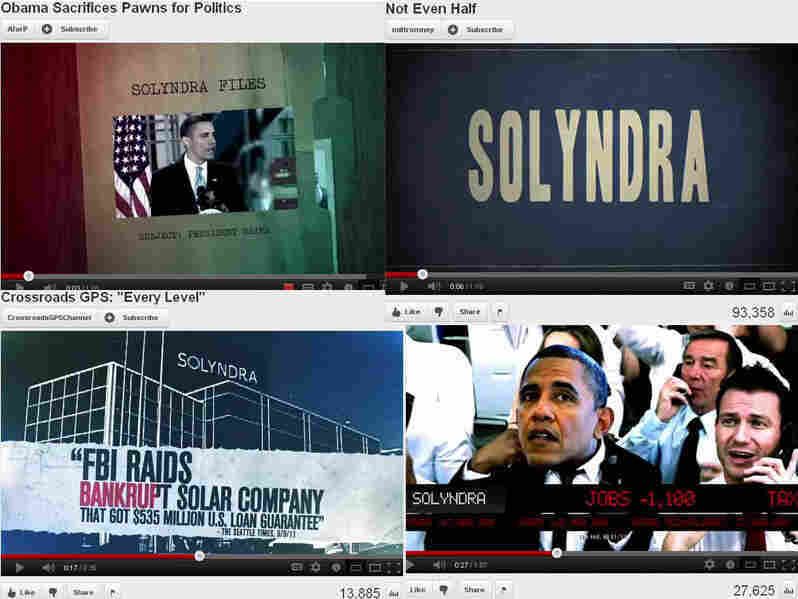 Take a look at a line of Republican campaign ads that have all been taking aim at Solyndra, a solar-panel maker that got loan guarantees from the Obama administration and then went bankrupt. The campaign of Republican presidential candidate Mitt Romney released a Web video this week that claims: "More than $16 billion have gone to companies like Solyndra that are linked to big Obama and Democrat donors." Another Web ad also released this week comes from the American Crossroads superPAC, which says: "Obama invested our tax dollars in Solyndra [and] lost half a billion." No surprise here. Republican strategists see Solyndra as a ripe target. But another shot at the same target earlier this year came from Crossroads GPS, a tax-exempt organization under section 501(c)(4) of the tax code, which makes it a "social welfare organization." Other groups similarly designated as social welfare organizations by the IRS include Rotary International, Lions Clubs, the NAACP and your local volunteer fire department. But lately, it's been political strategists, not community activists or issue advocates, who are launching 501(c)(4)s.
Crossroads GPS was set up to complement the superPAC American Crossroads. It's the same with Priorities USA, which is tied to a superPAC supporting President Obama, although they've spent just a fraction of what the Crossroads groups have spent. "There is, I would say, an escalating experiment in pushing the envelope," says Greg Colvin, a tax attorney whose specialty is tax-exempt organizations. "The problem comes when the driver behind the advertising is the election itself rather than a particular policy that's in the public interest." 501(c)(4)s like these can use money in a way that isn't available to candidates and superPACs. Under election law, campaign committees are limited in the size of the contributions they can accept; superPACs are not limited. But either way, the money is disclosed. As for 501(c)(4)s — there are no contribution caps, and no disclosure. NPR examined the finances of the superPAC American Crossroads and the 501(c)(4) Crossroads GPS. When the groups started out two years ago, donors gave almost evenly to both. But since then, the donors have flocked to the secret side. In the first three months of this year, nearly 80 percent of the incoming cash went to Crossroads GPS. And it wasn't coming from ordinary campaign donors. In 2010 and 2011, nearly 90 percent of the Crossroads GPS money came in chunks of a million dollars or more. Most of this money ends up on TV. Dan Backer is a campaign finance lawyer whose client base includes candidates, superPACs and 501(c)(4)s, mostly on the right. "A lot of the communications from the superPACs and from the '(c)(4)s' and the campaigns are essentially interchangeable. If you didn't have outside groups, I think campaigns would be running a lot of these same ads," says Backer. One legal hurdle is that the Internal Revenue Service says 501(c)(4)s cannot intervene in political campaigns as their primary activity. Now here's the loophole: If an ad doesn't tell voters how to vote, it can count as an issue ad — not a political one. So 501(c)(4) ads use tag lines like: "Tell President Obama American workers aren't pawns in your political games," which comes from Americans for Prosperity. "If you spend 25 seconds bashing a candidate or bashing a position he holds, and then say, 'call this candidate up and tell him not to do this bad thing that they're doing,' you know, it's a lawyer's line that they're setting up. So at the end of the day, there really is no difference in my book," says Adam Strasberg, a media consultant on the left who has produced plenty of issue ads. If this seems like a case of modern realities leaving the old rules behind, that's right. The last time the IRS issued definitive rules on 501(c)(4) political activity was 2004, years before a series of Supreme Court rulings and the subsequent rise of the million-dollar donor. Now, neither the IRS nor Congress seems eager to tell a bunch of powerful political operatives what they can and cannot do.